It's easy to put bacon on a bad thing and make it a good thing. A real challenge is taking something that's already good, and improving it with bacon. McDonald's is taking up that challenge with the venerable Big Mac. 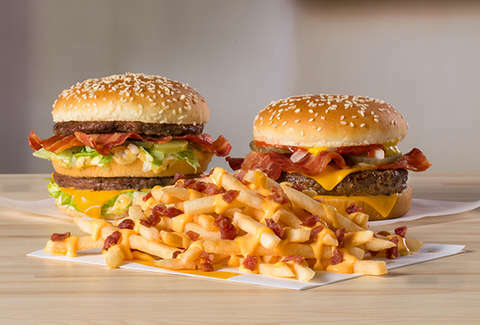 On Wednesday, McDonald's announced that it's officially debuting three new bacon-based items: the Big Mac Bacon, the Quarter Pounder Bacon, and, perhaps most excitingly, the Cheesy Bacon Fries, which, as we've pointed out, might in fact be the perfect munchies. Unfortunately, these items will only be around for a limited time, but you, too, will only be around for a limited time. Makes you think, huh? The day of jubilation/start date for these items is Wednesday, January 30. Both the Big Mac Bacon and Quarter Pounder Bacon will contain all the stuff you expect from them, plus three pieces of Applewood smoked bacon. The Cheesy Bacon Fries will feature "real cheddar cheese sauce and smoked bacon bits" over McDonald's fries, which clearly need no introduction. From a strictly legal perspective, there's nothing preventing you from ordering bacon fries to go with your bacon burger. Just dignity, probably.